More than a dozen swastikas were drawn in the snow on car hoods last January on Meyran Avenue. The layer of snow covering campus should give Pitt those cozy winter vibes we’ve been sorely missing. Instead, a walk down McKee Place, Louisa Street or Atwood Street on Sunday probably wouldn’t have left you walking blissfully through a winter wonderland. 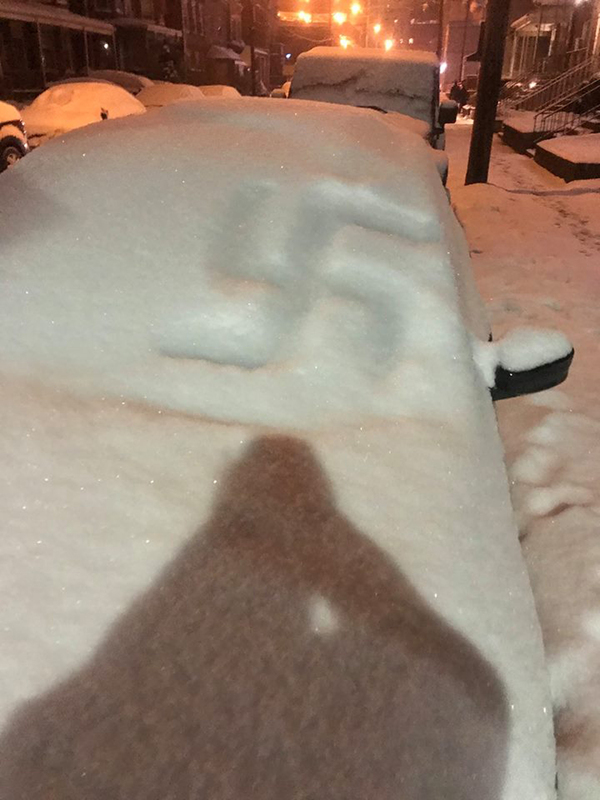 Pitt student Mara Keen found racial slurs — specifically the N-word — written in snow on car hoods in South Oakland Sunday night — a jarring sight for anyone strolling down the street. We’ve all heard slurs that target a wide range of ethnicities, religions, genders and sexual orientations. Anything that makes a person different from the norm or adds to someone’s identity can be treated with a derogatory attitude. But there is no place for this kind of language at Pitt or in Pittsburgh. The fact that there’s racism and bigotry in the world is unfortunately not astounding by any means. In an interview with The New York Times last Thursday, Rep. Steve King, R-Iowa, gave his support for “Western civilization’s values” and said he supported full assimilation of immigrants to these values. King was condemned immediately for his remarks and removed from his House committee assignments. The House, including King, then passed a resolution condemning white nationalism. He’s just the latest example of a major public figure who made racist comments and who fortunately faced some consequences for his actions. These words, of course, are incredibly offensive to a large portion of Americans and have the ability to cause them harm, both on an individual and cultural scale. But when you’re walking down your own street in your own neighborhood and see the N-word written by people you live with and go to classes with, that can feel especially personal and hurtful. This isn’t the first time hateful words and images have been spread in Oakland. More than a dozen swastikas were drawn in the snow on car hoods last January on Meyran Avenue. Acts of hatred like these feel especially significant following the Tree of Life Synagogue shooting in October, when a man walked into the synagogue about a mile away from Pitt’s campus and killed 11 people. There is so much hatred in our country, in our City and on our block that has already irrevocably changed our community. Spreading more hatred through the streets is exactly what we don’t need.